Kevin is such a thoughtful hubbie! He stopped by my car (I was still at work) on his way home from work one day. He left me a note that he had written on a napkin and stuck it in the door handle. How sweet! 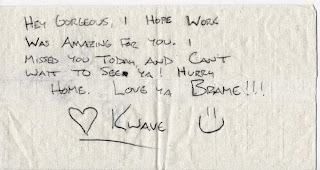 (Brame and Kwave are our nicknames for each other... haha) I love him so much!